We’d love your help. 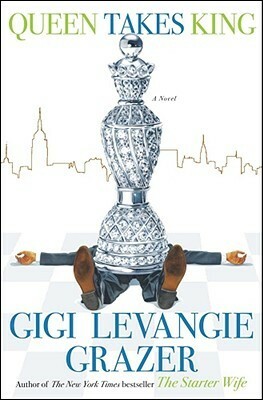 Let us know what’s wrong with this preview of Queen Takes King by Gigi Levangie Grazer. Jackson Power. A name like the man himself: aggressive, ambitious, bullish. The prodigal son, heir to millions, built his own Manhattan real estate empire and revels in seeing his moniker -- Power! -- on glittering skyscrapers around the city that never sleeps. Beneath his desk in the towering Power headquarters, Jacks has a stack of newspapers and photographs of himself, Jackson Power. A name like the man himself: aggressive, ambitious, bullish. The prodigal son, heir to millions, built his own Manhattan real estate empire and revels in seeing his moniker -- Power! -- on glittering skyscrapers around the city that never sleeps. Beneath his desk in the towering Power headquarters, Jacks has a stack of newspapers and photographs of himself, shaking hands with the most famous men and women of his generation. Here's a man who's always loved to see his name in ink. Until now. Cynthia Hunsaker Power. She is the epitome of elegance and society. The perfect foil for a man of Jacks's stature -- his first and only wife, he'd proudly tell any of his Master of the Universe (read: Gargoyle) friends. The former prima ballerina arrived in New York at eighteen, off the bus from Missouri, brimming with talent, beauty, and drive. She met a struggling painter, fell in love, and only later learned she'd won the Power lottery. Now she sits on the New York Ballet Theater board, effortlessly outdoing herself with one gala after another. But the press coverage of the Power silver anniversary party at the Waldorf takes the cake. Jacks Power appears twice in the "New York Post" the next morning -- once gallantly dancing with his wife of twenty-five years, Cynthia; and once hand in hand with Lara Sizemore, morning television star, exiting her Upper West Side apartment building that very same night. To Jackson Power, Lara is ever ything his wife Cynthia is not -- wild, voluptuous, mysterious, and selfsustaining. A new passion has swept Jacks off his well-shod feet -- and she is Lara Sizemore. He is ready for the divorce, ready to marry his mistress, America's Sweetheart. But Cynthia isn't ready to be swept out of the picture quite so easily. Whether they're changing the locks on each other in their Park Avenue triplex or sabotaging each other's dinner parties, it's The People's Billionaire vs. The Ballerina, in a split-up that will trump the most scandalous divorces known to polite New York society. Cynthia's got their twenty-five-year-old artist daughter, Vivienne, in her camp; Jacks has the young bartending playwright Adrian, whom he intends to pay to seduce Cynthia into an easy split. But Cynthia might have a few tricks up her well-tailored Chanel sleeve, and she -- like Jacks -- is prepared to use every weapon in her divorce arsenal to win the game. It's a battle of wits, of charm, of two of the biggest egos -- and personalities and bank accounts -- in Manhattan, and neither side will go down without a fight. To ask other readers questions about Queen Takes King, please sign up. This review has been hidden because it contains spoilers. To view it, click here. I was surprised by the lower score reviews on this book as I was reading it. However, by the time that I finished reading the book, I could see exactly why this book had lower scores than some of her other books. It just felt like the ending was hurried and contrived. None of the characters seemed to come to the end that Ms. Grazer had been leading up to. The daughter Vivi and the bartender Adrian, their hint of romance fizzling and dying with no real explanation (other than he slept with her mot I was surprised by the lower score reviews on this book as I was reading it. However, by the time that I finished reading the book, I could see exactly why this book had lower scores than some of her other books. It just felt like the ending was hurried and contrived. None of the characters seemed to come to the end that Ms. Grazer had been leading up to. The daughter Vivi and the bartender Adrian, their hint of romance fizzling and dying with no real explanation (other than he slept with her mother!). Yet, the author spent so much time at the hint that the lesbian Vivi might just be able to fall in love with Adrian. Jackson Power ended up in the same position, the all-powerful "kept" man whining about what his love (his former mistress turned fiancee) was up to. Most disappointing was the end for Mrs. Powers. Just when you think that she had firmly established her voice, independence, and style, you are left to believe that she falls for the same kind of jerk as her ex. It wasn't poorly written, it didn't make me want to gauge out my eyes or yank hair out in fistfuls. But it also didn't have a single original thought, character or plot twist. I may just be burnt out on the genre but I could cry from The Boredom. Does chick lit and/or trashy fiction have nothing new to offer anymore? Her writing style annoys me. The style is merely a continuous stream of conversation back and forth, which is short, choppy, and irritating to read. This book, much like her other one I think, would make a better movie. Just not motivated to finish it. I like a good beach read, but this book did not measure up to those meager standards! I felt cheated reading about the Jackson Power character. Why? Because it seemed the author gathered tabloid articles from the 80s/90s/TMZ about Donald Trump, changed the name to Jackson Power in MS Word, and fashioned a story around these press clippings. Secondly, Jacks' admin spoke in "pidgen" english and was a Jamacian stereotype. ARGH - I think this pissed me off the most about this book! I mean really, how I like a good beach read, but this book did not measure up to those meager standards! This is a guilty-pleasure read. It was amusing to see the rich and famous messing up their lives so completely. None of the characters was particularly likeable--although I sympathized with Cynthia the most--but the book was certainly never boring. And all the great Zorba quotes ("When everything goes wrong, what a joy to test your soul and see if it has endurance and courage!") made me want to read Zorba the Greek. I grabbed this on my way out of town (because the cover was sparkly), and it beat my expectations! I thought her first book was decent (Starter Wife) but the show wasn't great, so I didn't have high hopes for this one. It proved me wrong, and kept me turning the pages. Cute characters, good storyline that didn't have me in a lull in the middle of it. A nice quick read! I've read her stuff before and never liked it so I dont know why I thought this one would be different. Her writing is kind of stilted and doesn't flow smoothly, which throws me off when I get into a rhytmn. I was looking for some good brain candy reading and this wasn't it. Ugh. And now I'm mad at myself for even finishing it. I think this book could have done the job without the constant f-bombs. I'm no prude, but come on. These weren't socialites, they were truckers. Other than that, pretty predictable. so much ick that I barely got past page 50. It was meh. Predictable and boring. Mildly interesting...imagine "Lifestyles of the Rich and Famous" files for divorce. Not good. Didn’t care about any of the characters. The last two books I’ve read by this author haven’t been good, so I won’t be reading any more of her books. K. I liked cynthia and Vivienne. An easy read, husband cheats on wife, gets caught, time for a divorce. “Queen Takes King”, with a title like that, you expect a thrilling and fast paced battle between the sexes. Alas, this book has failed on so many levels. This one was also my unplanned venture into reading a book without any prior knowledge. Sometimes I like to randomly pick a book and look for anything interesting in it. This time it was the cover page and title of the book that did the trick. Whoever has said “Don't judge a book by its cover”, must have been talking about “Queen Takes King”. This story is about Cynthia and Jackson Power, The Power Couple of elite and high-class society. Power couple, who were married for twenty-five long years and just when they are celebrating their big anniversary, tabloids decided to spice up their married life, by introducing a triangle called Lara to their life. Lara a successful (but not so successful in her own eyes) TV anchor/journalist. Lara is a modern woman with ambition, dreams who thinks of making it big in media world. Everything get ruined for all the three main characters when affair between Jackson and Lara became main subject of Gossip magazines. Now, what will you expect the story to do from here? I would have expected it to go ugly. I would have expected Cynthia, the wife, to take charge of her life and diminish the third unwanted character in her life. I wanted her to take a beautiful strategic revenge on her cheating husband. I wanted Lara, the girlfriend, to control the man, Jackson. I wanted Lara to show that she is not an ordinary affair, that she can't be taken advantage of. Above all, that she has full control over her life, job and ambitions. I wanted Jackson, the husband, to feel remorse for breaking up a marriage, but I also wanted him to come clean of it. I wanted him to give a closure to his wife,to tell her that she is not the reason(or, if she is the reason behind). To tell her, that it's actually him who is failing. Or, to really twist the story, and fight. Fight with full passion and Power. Oh, but I want so many things. Who cares? Only thing that the Power couple seems interested about was getting divorce and that's all. Some side characters are more interesting than the main ones, like Cynthia's psychiatrist, or her lesbian daughter Vivienne, Adrian the bartender. But, the most charismatic is “the devil”, Jackson's father. He has all the wicked and crooked characteristics of a business tycoon. It's movie rights are already sold, and I am wondering who will play the leads in this divorce drama. Who cares? I am not going to waste any money or time on that movie. I really wanted to love this one but it felt so forced and certain characters were really one dimensional, like daughter Vivi, lesbian & frumpy....eh! She could have been a much greater attribute to the story. The ending was just abysmal. The characters and circumstances in Gigi Levangie Grazer's latest book QUEEN TAKES KING", could have been taken directly from the pages of your favorite supermarket tabloid.......or perhaps The New York Post's PAGE SIX. Jackson "Jacks" Power wants a divorce from Cynthia, his wife of 25 years, in order to marry Lara, a potential "trophy wife". Jacks, being Jacks, doesn't want to face the possibility of losing his tri-plex at 740 Park Avenue in the divorce so he devises a plan to ensure he retains The characters and circumstances in Gigi Levangie Grazer's latest book QUEEN TAKES KING", could have been taken directly from the pages of your favorite supermarket tabloid.......or perhaps The New York Post's PAGE SIX. Jackson "Jacks" Power wants a divorce from Cynthia, his wife of 25 years, in order to marry Lara, a potential "trophy wife". Jacks, being Jacks, doesn't want to face the possibility of losing his tri-plex at 740 Park Avenue in the divorce so he devises a plan to ensure he retains possession of the family homestead. Cynthia, it seems, has a few plans of her own. Jacks persona is easily recognizable. He is part Donald Trump, part Tony Robbins and part Muhammad Ali in his youth (I am the greatest). Where "The Donalds" combover has been the subject of many a snarky remark, Jacks hair also seems to be a topic for discussion as illustrated by Jacks father who states, "You know that hair of yours looks ridiculous". It appears that Ms. Grazer has drawn on the invaluable resources contained in the idiosyncrasies and foibles of individuals in her inner circle and has created a cast of characters whose antics are hilarious. You will love Cynthia's shrink, Goldie with his Zorba the Greek philosophy of life and her New York Ballet Theater BFF, Margot, she of the salty language. The are just two of the colorful characters who dance through the pages of this amusing tale. With the help and encouragement of their lesbian daughter Vivi, Cynthia transforms herself and shows Jacks that she too is a "Power to be reckoned with". (pun intended). From the title Ms. Grazer gave her book it is obvious that she sees divorce as a chess game played out on the big board of life. I, however, saw it more as a game of Monopoly that attempts to answer the age old question, "Can you really be happy and fulfilled without owning Boardwalk and Park Place"?? Nothing new here. The title pretty much explains the entire plot of the book. I was hoping for a new twist to the old "War of the Roses" story, but there's not a character or a subplot that is refreshing or originial. You've already read this book under another title. The Power couple, Jacks and Cynthia are stereotypes and caricatures of the rich and famous who think that money and looks can buy anything and that youth lasts forever. Their answer when the divorce battle begins -- get what they w Nothing new here. The title pretty much explains the entire plot of the book. I was hoping for a new twist to the old "War of the Roses" story, but there's not a character or a subplot that is refreshing or originial. You've already read this book under another title. The Power couple, Jacks and Cynthia are stereotypes and caricatures of the rich and famous who think that money and looks can buy anything and that youth lasts forever. Their answer when the divorce battle begins -- get what they want through fair or foul means -- efforts at one-upmanship that actually seem petty, rather than clever, in this case. The relationships between all of the characters seem shallow and undeveloped. It's the age old story of the beaten down wife who makes good after she finally escapes her egotistical and needy husband. The fact that the couple is extremely rich, talented and connected only increases the scale of the war - not the purity of it. There's no moral here as all of them play fast and loose with the truth and their feelings. They act up and act out in ways more suited to teenagers than middle-aged adults. The ending comes abruptly and is as unrealistic as the rest of the novel. I tried to find some humor in the book, or at least a bit of sentimentality, but alas, both were lacking in a rather mundane and trite book that leaves the reader wondering why the story needed to be told...again. This book is one that might be enjoyed in a mindless sort of way, but only if you don't ask yourself too many questions about it! If I read two other books while trying to finish this thing it must be because this book was BORING! It drags on about two main characters that are so full of themselves. I can't tell if she actually wants you to feel sorry for Jacks Powers the most powerful man in NY and his cheating that lead him to his one true love who holds his heart. Or his soon to be ex wife Cynthia the beautiful former ballerina who is just dull and boring. I wasn't turning the pages to see what happens next I was trying If I read two other books while trying to finish this thing it must be because this book was BORING! It drags on about two main characters that are so full of themselves. I can't tell if she actually wants you to feel sorry for Jacks Powers the most powerful man in NY and his cheating that lead him to his one true love who holds his heart. Or his soon to be ex wife Cynthia the beautiful former ballerina who is just dull and boring. Why do I keep picking up books from this author? For chick-lit, she totally pisses me off. This book was essentially about a man and a women who are divorcing because he cheated on her and she found out on their 25th wedding anniversary. She doesn't give up easily, even though it's his money. He tries to set her up to "cheat" on him with some bar tender, but his gay daughter ends up falling for him. Also, the women he has cheated on his wife with drops him like the second the media finds out bec Why do I keep picking up books from this author? For chick-lit, she totally pisses me off. This book was essentially about a man and a women who are divorcing because he cheated on her and she found out on their 25th wedding anniversary. She doesn't give up easily, even though it's his money. He tries to set her up to "cheat" on him with some bar tender, but his gay daughter ends up falling for him. Also, the women he has cheated on his wife with drops him like the second the media finds out because she is a news anchor and wants to be taken seriously and doing this doesn't make anyone take her seriously. Does the man and women end up together in the end, because neither have anywhere better to go? I don't remember. Nor do I care. So you loved Maneater and Starter Wife and you think hey it's Gigi. Well think again. This book is set in New York, starring the Powers (think Trumps). It is reminiscent of reading Vanity Fair back in the 80's when NY was happening and Cornelia Guest was a deb. I can't explain why but it is harder to get interested in the marital breakdown of an Uber rich NYC couple verses an Uber rich LA couple. Maybe it is because the lifestyles in LA seem so superficial and silly while in NYC they seem depres So you loved Maneater and Starter Wife and you think hey it's Gigi. Well think again. This book is set in New York, starring the Powers (think Trumps). It is reminiscent of reading Vanity Fair back in the 80's when NY was happening and Cornelia Guest was a deb. I can't explain why but it is harder to get interested in the marital breakdown of an Uber rich NYC couple verses an Uber rich LA couple. Maybe it is because the lifestyles in LA seem so superficial and silly while in NYC they seem depressing. None of the characters in the book are particularly likeable. And you really don't care what happens to them.